My 16-year old daughter (gosh I'm old) has a first aid kit and a cell phone in case she gets into car trouble. So this year I'm getting her a car emergency kit. After researching them I settled on the AAA 77 Piece Warrior Road Assistance Kit . It's the same as I have but with a few useful additions including a fleece set (cap, gloves, and scarf) for when it's cold and a self-charging flashlight. Of course the first aid kit is 45 pieces so 77 isn't really that grand. The best part about it is the bag. Everything wraps up nicely, including the charger cable which, in my experience, is sometimes like getting an injured snake into the trunk. 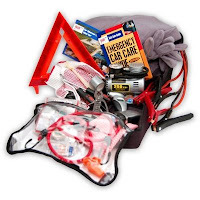 Details: AAA WARRIOR 77 PIECE ROADSIDE ASSISTANT KIT INCLUDES:1 AAA car care guide, 1 AAA membership brochure, 1 8 gauge 10 foot heavy duty booster cable, 1 250 PSI air compressor with guage, 1 hand crank flashlight, 1 fleece cap, 1 fleece scarf, 1 pair of fleece gloves, 1 digital tire gauge, 1 reflective triangle, 1 stainless steel multi tool with sheath, 1 pair of gloves with grips one one side for better gripping, 1 emergency poncho, 1 emergency whistle,, 1 roll of duct tape, 1 phillips screw driver, 1 flat head screw driver, 2 bungee cord, 2 shop cloth, 10 cable ties, 45 pieces of first aid, 1 premium double sided padded carry bag with handle. 13.5 x 10 x 8 inch bag size. If you find any emergency kits that are better let me know!